We had an amazing stay: clean, modern, very well equipped, quiet, in the heart of Montreal. Would not have expected it from the outside. Would return in a flash!!! Appartement très fonctionnel, joli, très bien équipé. Quelques problèmes pour l'ouverture de la porte mais une grande disponibilité et promptitude du responsable pour le résoudre. Perfect apartment for my stay! Check-in and communication was prompt and easy. The apartment was very clean and perfectly arranged. The pricing is on point. I would definitely come here again! The Hotel for the future. Well all amenities were excellent, but for the parking. My sugestion is for parking to be included due to the hotels' location downtown. Ravie de la propreté, de la sécurité et de l aménagement de l.appartement. c'est exactement comme sur les photos. Seul petit bémol, il n avait pas de verre et l'eau et le chauffage mettent du temps à être à bonne température. Mais c'est pas trop grave. over all the stay is enjoyable, except all the towels were wet, so I was confused if they were clean or not. My fiancée and myself had a very nice stay at your hotel and would very much like to come back eventually! The mattress was very comfortable and the bedding was nice and clean. One thing I have to mention though is that the bathroom shampoo and bath soap is not very sanitary as it is left open with no cover and the mix of different soaps is a little questionable. Apart from that, it was an excellent experience at the pierce boutique hotel! The place was so modern and clean. It was downtown so everything was very convenient! The kitchen had all appliances I needed to cook so that was a plus! 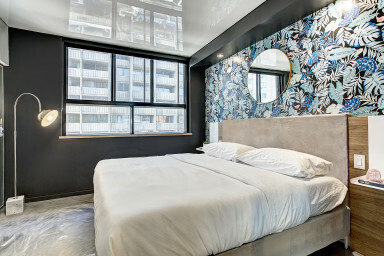 Hi stayed at the pierce hotel for a night and was very satisfied location was amazing, condo was very new and clean, as well as very well equipped. First of all, the website that we booked the apartment through showed is a TOTAL PRICE of $82. There were extra charges quite literally hidden on the confirmation page, which nearly doubled what the actual price was. That was not on the property. That was on the booking site. Nevertheless, it was an unpleasant surprise. We found the place to be a comfortable, modern and nicely decorated 1 bedroom apartment with good amenities in the unit. Unfortunately, there was no parking in the building and the closest public parking charged $24 for a day. That brought the total of our stay to nearly $200. For that price, we could have stayed at one of the other hotels where our friends stayed and not dragged our suitcases on the ice in the streets. The other thing is that we found the security deposit at $500 to be extremely high. And what's very puzzling is why does it take "up to 7 business days" to receive the deposit back in our bank account, depending on our financial institution? I have traveled all over the world and never have I heard of such a thing. If it takes seconds to receive the money, it should take you just seconds to redeposit it, especially when everything is done electronically and the financial institution is a reputable Canadian bank. I am still waiting for my refund. Finally, we were not able to use the very nice showers as there was only boiling hot water and the tap wouldn't turn to the colder settings. I suggest you include a parking coupon in your rate, stay on top of the maintenance of the main utilities such as water, and do something about the security deposit situation.